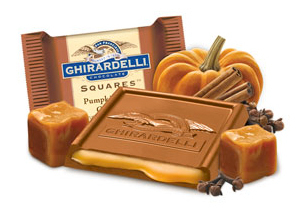 Ghirardelli Pumpkin Spice Squares, so glad I didn’t discover these sooner…. I filled the family’s stockings with a variety of Ghirardelli squares so that everyone could get a candy that they liked. I had never tasted the Pumpkin Squares until Christmas day, and I am so glad that I hadn’t. My closet would have been filled with bags of these. They have the best of 3 worlds; Caramel, Milk Chocolate, and Pumpkin. It is taking all of my will power to stay away from the grocery store, and not buy up all of the left overs….If you haven’t tried these yet, you should. Seasonal candy really is a treat and I’ll add these to my favorites list. Posted in Caramel, Christmas, Milk chocolate. Bookmark the permalink. I have had two different kinds of Ghiradellie chocolates this week. Both were dark chocolate with sea salt. One had caramel filling, the other almonds – oh my goodness! Yum! I must try both of those soon!